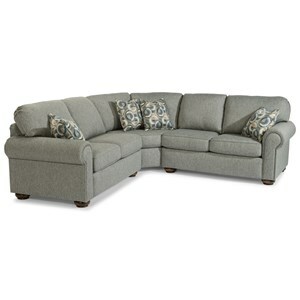 Create a cool and casual living room or family room space with this modular six piece sectional. This sectional features spacious, plush seats that are perfect for lounging while the full-grain leather cover will make you feel luxurious. Clean lines create a contemporary look that will keep your home feeling stylish. 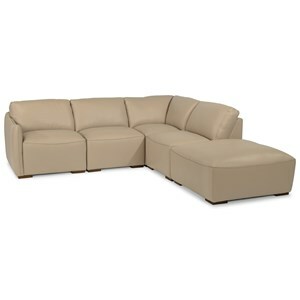 If the sectional shown isn't exactly what you're looking for, don't worry, this sectional is entirely modular and can be ordered in the configuration that fits your space best. The Latitudes - Morgan 6 PieceLeather Sectional with Ottoman by Flexsteel at Fashion Furniture in the Fresno, Madera area. Product availability may vary. Contact us for the most current availability on this product. 1119-19 Armless Chair 2 31" 40" 34"
1119-231 Corner Chair 1 39" 40" 34"
1119-092 Cocktail Ottoman 1 39" 39" 18"
1119-17 LAF Chair 1 35" 40" 34"
1119-18 RAF Chair 1 35" 40" 34"
Padding & Ergonomics The Luxury Cushion (LC) consists of a moderately firm polyurethane foam core wrapped in recover foam and a sift fiber wrap. Plush and inviting are the themes of this group of living room furniture. Each piece in this collection features luxurious full-grain leather on the wide and deep seats that will entice your friends and family to sit back and relax while the clean, straight lines will keep your space looking modern. Offering a modular sectional, chair and ottoman, this collection allows you to piece together the perfect configuration for your space and family. The Latitudes - Morgan collection is a great option if you are looking for Contemporary Casual furniture in the Fresno, Madera area. Browse other items in the Latitudes - Morgan collection from Fashion Furniture in the Fresno, Madera area.